Fill with rich milk (2 oz Half & Half), shake once without and once with ice, and strain into a large bar glass (split into 2 punch cups). Garnish with freshly grated nutmeg. Two Wednesdays ago, I discovered that the 1888 The Police Gazette Bartenders Guide was digitized on EUVS; I was glad to be reacquainted with the book after having a chance to peruse the 1901 edition back at Gary Regan's Cocktails in the Country in 2015. 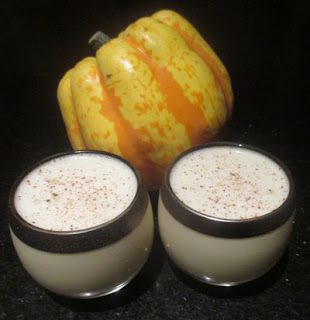 The recipe that caught my eye was the Imperial Egg Nogg that paired brandy with Jamaican rum as the spirit base. Since there was no other flavor modifier or spice in the mix other than the nutmeg garnish, I opted for a funky rum to add some pizazz to the drink. In the glass, the Imperial Egg Nogg issued forth a nutmeg and rum funk aroma. Next, a creamy sip shared a caramel note from the aged spirits, and the swallow proffered the expected duo of Cognac and high ester Jamaican rum. Shake with ice, strain into a cocktail glass, and garnish with a cherry (grapefruit twist). Two Tuesdays ago, I delved into the 1937 Café Royal Cocktail Book and spotted the Curzon which for a second reminded me of the Curazõn on the Green Street menu. The Curzon here was not a misspelling of the Spanish word for "heart" but was a British family name which matched the drink book's origin. The grapefruit as the only citrus here reminded me of the Commercial Free, so I was curious to see how similar in feel the two were. Once prepared, the Curzon offered grapefruit and chocolate notes to the nose. Next, grapefruit and a darker note from the cacao or perhaps the barrel aging filled the sip, and the swallow broadcast brandy and rum flavors melding into chocolate with grapefruit's bite on the finish. Shake with ice, strain into a rocks glass, and garnish with a cucumber wheel. (*) Cucumber was peeled, cut into 1 inch pieces, blended, and fine strained. The juice was mixed with an equal volume of sugar and stirred with a spoon to dissolve it without heat. Another of the syrups that I made for the Cocktail Lab at Earl's two weeks ago was a cucumber one. I decided to take it in a tequila direction since agave often pairs well with cucumber flavors such as in the White Buddha. For added herbal and spice elements, I added a touch of Yellow Chartreuse and Angostura Bitters to the mix. For a name, I stuck with the Yukio Mishima theme and dubbed the concoction Forbidden Colors. Shake with ice, strain into a glass, and garnish with a floated lemon peel mask. (*) Per peeled and chopped kiwi fruit, blend with 1/2 oz water, fine strain, and mix with an equal amount of sugar. Dissolve sugar by stirring without heat. As I was thinking about what produce to utilize for my night at the Cocktail Lab at Earl's Prudential, I spotted kiwi fruit at the store and remembered how tasty the shrub I used in the Kiwi Kollins was. Therefore, I decided to go with it and take it this time in the syrup direction instead. As I contemplated the soft fruit notes of kiwi fruit, I latched onto Genever as a base for it often pairs well with other fruit flavors such as rhubarb in the Old New York Cocktail, peach in the Under Lock and Key, and pear in the Church Key. To balance the sweet, I paired the syrup with lemon juice, and to accent the Genever's botanicals, I added a hint of Herbsaint. When it came time to naming the drinks, I went with a literary angle, and named all three after Yukio Mishima novels. This one I dubbed Confessions of a Mask after the first book I ever read from that author, and I shaped the garnish into a mask to link it back to the name. My second drink in the trilogy that night began with a syrup that I made from oregano from my garden. I originally thought about pairing it with sweet vermouth to match the Italian cooking spices, but I ended up switching to Pimm's. While I took it in a Pimm's Cup sort of direction with a split base of gin akin to a Tom Collins, it was much more herbal and less fruity than most Pimm's Cups and more flavorful than a Tom Collins. For a name, I kept on the Mishima track with The Sound of the Waves. Shake with ice, strain into a Collins glass with 2 oz soda water, add a straw, and garnish with a lemon wheel and oregano sprig. Stir with ice, strain into a rocks glass with a large ice cube, and garnish with a lemon twist on the cube. Two Sundays ago, I was perusing the Brooklyn Bartender book when I spotted The Truce by Torrey Bell-Edwards at the Willow. The drink started as a maple-Chartreuse Sazerac riff before progressing into its final form, and the Rye Old Fashioned with Green Chartreuse structure reminded me of a less bitter Clint Eastwood. Once prepared, The Truce gave forth a lemon oil over rye bouquet to the nose. Next, sweetened malt with a bit of mouthfeel from the maple syrup on the sip gave way to rye followed by a maple-Chartreuse herbal combination on the swallow. 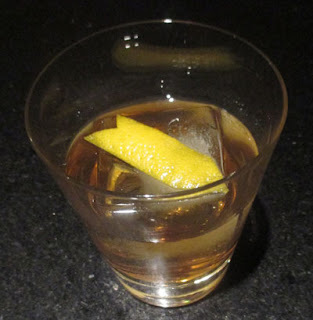 Stir with ice, strain into a rocks glass with a large ice cube, and garnish with a flamed orange twist (unflamed). 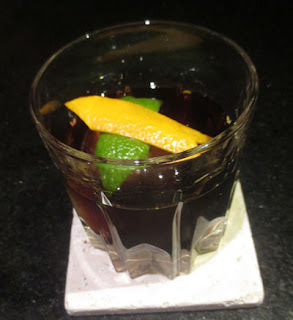 Two Saturdays ago, I spotted an interesting drink called the Mero Mero in Imbibe. The recipe was created by Jason Eisner at Los Angeles' Gracias Madre, and the name roughly translates to "top dog" or "godfather" in Spanish. Moreover, the ingredients appeared like an agave version of Death & Co.'s Grand Street so I was definitely curious to try it. In the glass, the Mero Mero proffered an orange, smoke, and light cherry aroma. Next, grape and cherry notes filled the sip, and the swallow shared smoky agave flavors along with earthy bitter notes melding into nutty Maraschino ones. Build in a rocks glass, add a large ice cube, and stir. Garnish with both orange and lime twists. 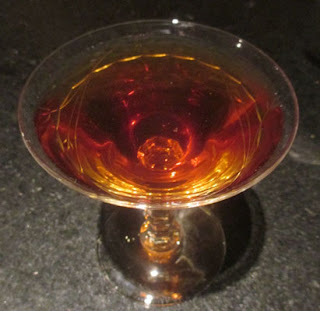 Two Fridays ago, I restocked Pedro Ximenez sherry at the home bar to make the Haitian Divorce from Amanda Schuster's New York Cocktails. 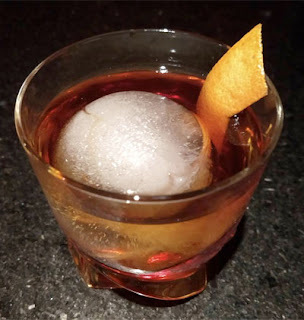 The recipe was crafted by Tom Richter when he was at the Beagle, and the form reminded me of the McKittrick Old Fashioned which also utilized the rich sherry as a sweetener. Here, the Haitian Divorce gave forth smoke and raisiny aromas along orange and lime oil notes. Next, the sherry's robust grape filled the sip, and the swallow offered rum, smoky mezcal, and raisiny sherry flavors with a clove spice-driven finish. 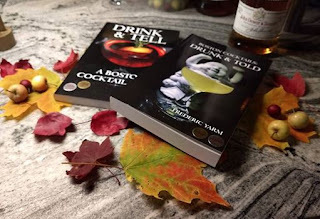 Between the two volumes, there are 1350+ cocktail recipes created in Boston during the Golden and Silver Eras circa 2006-2017, plus essays and articles on Boston bars, bartenders, and drinking styles on top of that all. Stir with ice, strain into a cocktail glass, and garnish with a cherry (omit) and lemon oil from a twist. After reading an article by Robert Simonson in the New York Times about the two Tuxedo Cocktail variations, I realized that I had never written up either here. 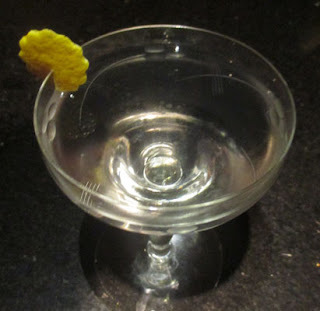 Therefore, I reached for my copy of the 1930 Savoy Cocktail Book and decided upon the second variation that came across like the Martini version of an Improved Gin Cocktail. Moreover, perhaps it was akin to a Moonshine Cocktail with orange bitters or a Silver with absinthe. In the glass, the Tuxedo Cocktail No. 2 offered a lemon oil aroma. Next, a clean white wine sip with hints of cherry led into a gin, nutty cherry, and orange swallow with a light absinthe finish. With a touch of sugar from the Maraschino liqueur, the drink was a bit more rounded and not as stark as the classic fifty-fifty Dry Martini, and thus, easier to linger over without fear of it warming up. Shake with ice, strain into a cocktail glass, and garnish with a lemon twist (lime and orange twists). Since my copy of Boothby's 1934 World Drinks & How to Mix Them was still out from the night before's research on the Quinquina Cocktail, I decided to utilize it for that evening's drink. There, I spotted the Liberty that reminded me of the Three Mile Limit in structure until I realized that the Sky Pilot was perhaps closer. Once prepared, the Liberty offered an apple and funky rum nose accented with citrus oils. Next, lime on the sip led into apple and grassy rum funk on the swallow. 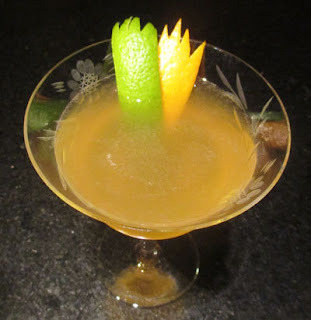 Two Tuesdays ago, I began flipping through the pages of Paul Clarke's The Cocktail Chronicles book when I came across the Quinquina Cocktail riff crafted by Chantal Tseng then of the Tabard Inn in Washington, DC. I was already taken by the recipe, but I sought out more information on Paul's 2010 blog post about the drink. Chantal originally found the recipe in Trader Vic's 1947 Bartender's Guide but later traced it back to Boothby's World Drinks and How to Mix Them. In my copy of Boothby's 1934 edition, the Quinquina recipe consisted of equal parts Cognac, quinquina, and peach brandy accented with two dashes of absinthe. Since dry peach brandy was not prevalent in 2010, it appears as though she swapped the orchard fruit to apricot liqueur and made the drink more spirit forward to dry out the balance. 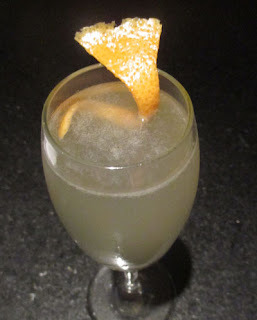 The Quinquina Cocktail offered up a lemon and apricot aroma with a hint of anise. 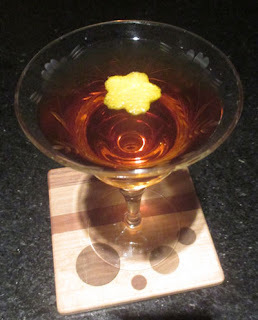 Next, the Bonal donated a red grape note to the sip, and the swallow began with Cognac followed by Bonal's bitter flavors melding into the apricot and ended with an absinthe finish. Shake with ice, strain into a punch cup, partially fill with ice, and garnish with freshly grated nutmeg. (*) A strong 5 minute steep of Twining's Jasmine Tea in boiling water. Strain (or remove the tea bag), add an equal volume of sugar, and stir to dissolve. (**) Equal parts guava jelly (the pectinized brick type) and water. Cut the jelly into small blocks, heat with water such as through microwaving, and stir until liquidy. It will stay thick but pourable even if refrigerated, and will be good if kept refrigerated for 2+ weeks. For my third drink for the Earl's Cocktail Lab two weeks ago, I decided on basing a drink on guava jelly. My mind quickly went to a pair of classic punches: the Barbadoes Punch from Jerry Thomas' 1862 Bartender's Guide and the West Indies Punch from 1869 Cooling Cups & Dainty Drinks. 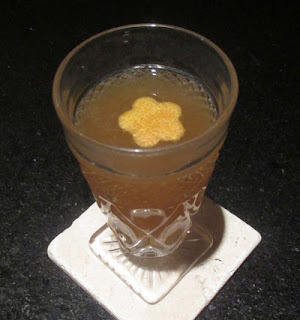 Similar to the Jakartoni, I kept the tea element found in the West Indies and other classic punches, and here I utilized a floral black tea in the form of a syrup. To balance the sweetness, I added lemon juice and a hint of a drying spice from Peychaud's Bitters. To round out the trilogy of drinks named after songs from The Cure's Disintegration album, I was lured in by Fascination Street. 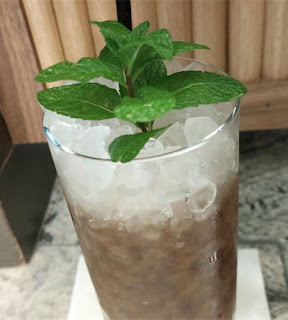 Shake with ice, strain into a Collins glass, fill with crushed ice, add a straw, and garnish with a mint sprig (later, it was a mint sprig + a paper umbrella). (*) In a pinch, substitute 3/4 oz cinnamon syrup and 1 tsp tamarind concentrate such as Tamicon from an Indian spice store, otherwise follow the directions below. (*) To make this syrup, break up 4 cinnamon sticks and add to 10 oz water in a pot. Bring to a boil and simmer covered 10 minutes. Add 10 oz sugar and 4 oz tamarind concentrate, stir while bringing back to a boil, cover, turn off heat, and let steep for 2 hours or more before straining. 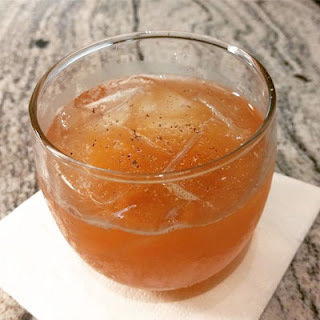 In thinking about other ingredients to bring to the Cocktail Lab at Earl's Prudential two Mondays ago, I thought about tamarind syrup and recalled how well it paired with rum, cinnamon, and lime in the Final Countdown. 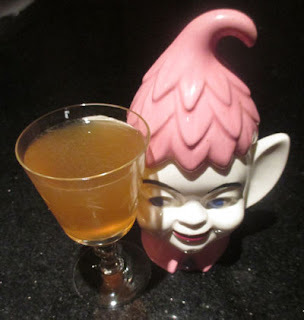 Veering from that drink's Jet Pilot format, I dropped the grapefruit juice to make it more of a Test Pilot in structure and brought in a smoky mezcal akin to the Mr. Howell Daiquiri utilizing Scotch. 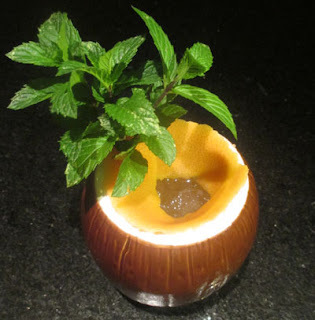 I took the drink in a Tiki direction by serving it over pellet ice with a mint sprig (and later a paper umbrella) as garnish, and I kept with The Cure's Disintegration theme by dubbing this one The Same Deep Water as You. Shake with ice, strain into a rocks glass (or cocktail coupe), and garnish with an oregano sprig (here, clipped onto the glass with a slitted lemon twist). (*) Cubed cantaloupe melon blended and fine strained. This juice was mixed with an equal part of sugar and stirred until dissolved. I avoided heat to retain more aroma and to not give the melon a cooked flavor. Two Mondays ago for my second shift at the Cocktail Lab located in Earl's Prudential, I decided to do an uniting theme of drinks named after song titles from The Cure's Disintegration album. For the first of the trio that I dubbed Prayers for Rain, I was inspired by the cantaloupes that I had been buying at my local market, and it reminded me of a Day of the Dead cantaloupe drink that I had tried years ago called the Marigold Ofrenda. I thought of this drink as a re-envisioned Margarita and returned some orange notes to the mix via Regan's bitters. However, the combination needed some pizazz so I added a touch of Galliano to donate complementary vanilla and star anise notes to the mix. 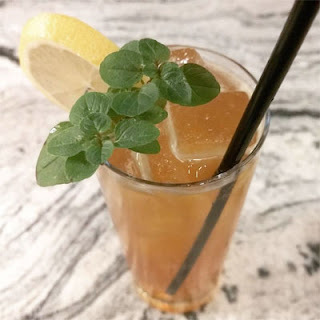 For a garnish, my oregano patch in my garden had been doing rather well and it seemed like a perfect Mexican-appropriate touch to the drink. Muddle mint in simple syrup, add rest of the ingredients, shake with ice, and strain into a cocktail coupe glass. Two Saturdays ago, I grabbed the PDT Cocktail Book off of the shelf and stumbled upon the Leap Frog. 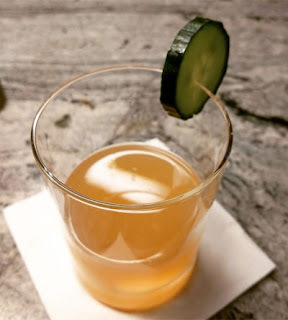 Jim Meehan created this drink as a riff on the Leaping Frog from Tom Bullock's 1917 The Ideal Bartender; his starting point was a recipe that was a shaken concoction of Hungarian apricot eau de vie and lime juice. 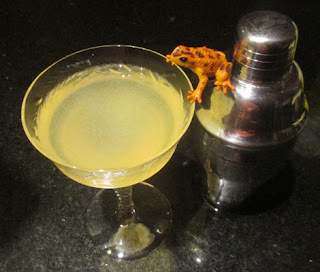 The same drink idea appeared in the 1930 Savoy Cocktail Book as the Hop Toad with lemon instead of lime. Here, it appears that Meehan was inspired by perhaps a combination of the Pendennis and Southside to make the original recipe more palatable. The Leap Frog offered up an apricot and mint aroma that led into a lemon sip with a hint of orchard fruit. Next, the swallow gave forth gin and apricot flavors with a mint finish. Shake with ice, strain into a Collins glass with ice, and garnish with a lemon wheel (lemon twist studded with 3 cloves). On Friday night two weeks ago, I selected a few volumes of The Cocktail Hour series and found an intriguing gem in the gin booklet. 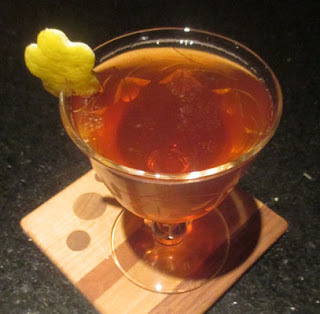 The recipe was the Weirding Way crafted by Ricky Gomez when he was at the Tear Drop Lounge in Portland, and it included the description of, "gently spiced, with layers of trade routes in a glass." The drink name is a Dune reference describing a form of movement training useful in close quarters fighting, and the drink itself had elements of a classic punch to it. Weirding Way gave forth a lemon, malt, and clove bouquet to the nose. Next, lemon, honey, and malt on the sip transitioned to Batavia Arrack's funk, Genever's malt and botanicals, and black tea flavors. True to a punch, the flavors were rather balanced here. Shake with ice, strain into a cocktail coupe, top with sparkling wine (1 1/2 oz Ninety+ Cellars Prosecco), and garnish with a lemon twist. 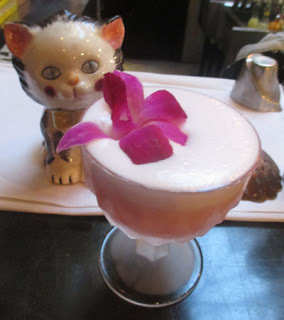 Two Thursdays ago, I was flipping through the pages of Amanda Schuster's New York Cocktails when I spotted a recipe called the Disappearing Act that reminded me of the one that Paul Clarke crafted for a Mixology Monday event in 2012 with the same name. 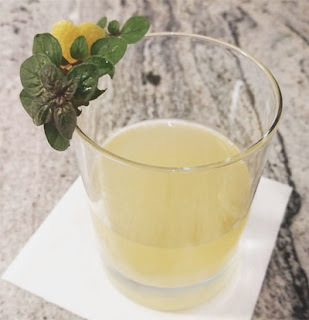 In essence, this Disappearing Act created by Manhattan's Nitecap bar was an aquavit for gin (or brandy) French 75 with Lillet and peach notes as accents. Once prepared, the drink offered a lemon-floral bouquet to the nose. Next, a carbonated lemon and white wine sip led into caraway, citrus peel, and peach notes on the swallow. Two Wednesdays ago, I turned to Pioneers of Mixing at Elite Bars: 1903-1933 for my evening's refreshment. There, I spotted the Harbor that reminded me of the Sonora and Tulip with their apple brandy, apricot liqueur, and citrus components. Once prepared, the Harbor shared an apple aroma with hints of apricot. Next, lime mingled with orchard fruit notes on the sip, and the swallow combined the apple and apricot into an almost novel flavor followed by a tart lime finish. Shake with ice, strain into a rocks glass (cocktail coupe), and garnish with an orange peel "cup" peel side down, filled with 151 proof rum (El Dorado), and ignited. On October 31st, I was flipping through my new book purchases and discovered that there was a small section of Halloween-themed recipes in Amanda Schuster's New York Cocktails book. The one that seemed most appropriate to crown the holiday was the Mutiny of Clowns by David Nurmi of the now closed Jakewalk. 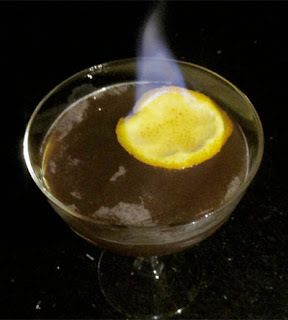 Once built and after the rum burned itself out, the Mutiny of Clowns provided an orange oil bouquet over dark blackstrap rum and Cynar aromas and sharp lime notes. Next, the lime matched the rum and amaro's caramel on the sip, and the swallow offered dark rum and vegetal funk flavors with a ginger finish that helped to tie the drink together. 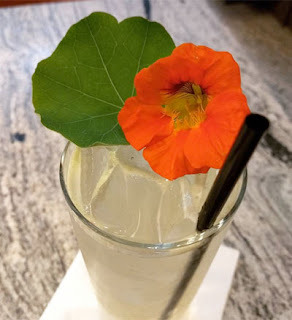 Shake with ice, double strain into a Collins glass with 3 oz soda water, fill with ice, add a straw, and garnish with a fresh nasturtium leaf and flower. 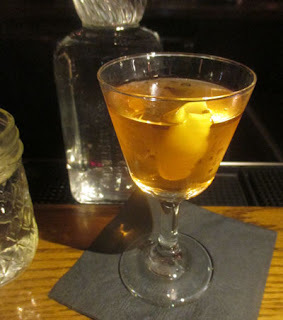 Two Mondays ago, I began my Monday night residency at the Cocktail Lab at Earl's Prudential with a three drink menu. The theme tying the trio together were herbs and fruit that either I grew in my garden or were foraged within a half mile of my home. As for the foraged aspect, I had already described the Crabapple Fight! (now with a photo from the event) that utilized three types of crabapples from the Davis Square bike path, and the second drink utilized my garden's sage by way of the Oaxacan Smash that I came up with over the summer. The third menu item featured nasturtiums that are in full bloom right now on the fringes of the garden. I was originally considering pairing this with a rum, but when I learned that nasturtiums are from Peru, I decided to go with cachaça to maintain a South American theme. For a format, I decided that a Mojito would be recognizable enough to lure people into drink cachaça. Overall, the peppery notes from the nasturtiums worked rather well with the grassy funky flavors of the Brazilian spirit, and the presentation with the bright flower and lily pad-like leaf did not hurt either. Shake with ice, strain into a cocktail coupe, and garnish with an ice cube. Note: I dissolved the sugar in the lime juice first. To cap off Sunday two weeks ago, I reached for Paul Clarke's The Cocktail Chronicles where I came across the Malecon. I immediately recognized that name from Thad Volger's By the Smoke and the Smell where he documented his trip to Cuba to learn about its rum production. 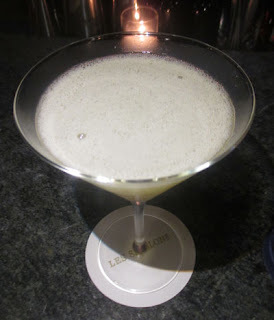 Here, the drink was crafted by Erik Lorincz at the American Bar at London's Savoy Hotel, and it was indeed named after Havana's waterfront promenade. The grape from the Malecon's port was brightened by lime notes on the nose. Next, the lime and grape intermingled on the sip, and the swallow paired the rum with nutty sherry that led to an anise-herbal finish. Muddle mint with sugar and water (I dissolved the sugar before adding the mint to muddle). Add the rest of the ingredients, remove the muddled mint, and fill with crushed ice. Garnish with fresh mint sprigs and fruit (omit fresh fruit). Two Saturdays ago, my search for that evening's drink led me to Trader Vic's 1972 Bartender's Guide. In the Julep section, I was lured in by the Legendre Mint Julep named after J. Marion Legendre who helped to create the absinthe-substitute Herbsaint in New Orleans circa 1934 after learning how to make absinthe while in France during World War I. 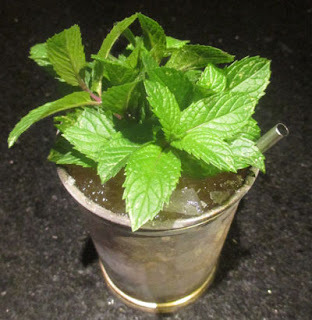 Besides the Herbsaint, the Julep contained the classic trio of Bourbon, mint, and sugar along with a dash of Jamaican rum which I often include in my Mint Juleps and Smashes. Once prepared, the Legendre Mint Julep shared a glorious mint bouquet to the nose. Next, a malt sip proffered a hint of vegetalness, and the swallow accented the Bourbon with a touch of rum funk and ended with a mint and anise finish. Indeed, the Herbsaint complemented the mint notes as they have in the Pliny the Elder and Pontarlier Julep. Shake with ice, strain into a Collins glass, fill with crushed ice, add a straw, and float 1/2 oz of house red wine. Normally, the outer vessel would contain dry ice in a water bath to garnish the drink with fog, but their supplier was out of dry ice that day. For my second drink at Backbar, I asked bartender Amanda Greenfield for the Punsch Ghoul Bowle which was the Halloween-themed drink of the week. 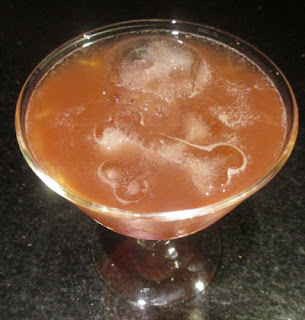 The drink was crafted by Kat Lamper and was subtitled, "A Halloween treat for grownups inspired by a punch bowl cocktail popular in 1900." When I inquired as to which drink it was based off of, I was shown David Wondrich's Punch book that was open to the section on Punschglühbowle; that recipe consisted of two parts light red wine to one part Batavia Arrack along with orange juice, lemon juice, and sugar that was served both heated and flaming. 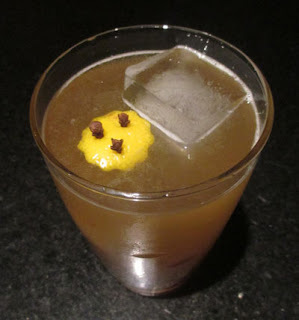 Here, the drink was more spirit driven with the addition of Jamaican rums and flavored with chocolate liqueur. The Punsch Ghoul Bowle began with a red wine aroma that gave way to a lemon and orange sip with a dark note from the crème de cacao. Next, the swallow showcased the funky rums and Arrack along with a complementary earthy note from the chocolate element. Over time, the red wine float entered the equation and appeared mostly in the sip. Shake once without ice and once with ice, strain into a cocktail coupe, and garnish with an edible orchid. Two Fridays ago, I needed to get out of the house so I walked over to Backbar. There, I found a seat in front of bartender Amanda Greenfield. For a first drink, I asked Amanda for the Pisco Flower that she attributed to Kat Lamper as her flowery take on a Pisco Sour. 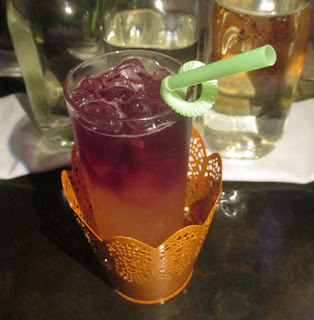 Once prepared, the Pisco Flower contributed a floral aroma from the orchid garnish and violet liqueur. 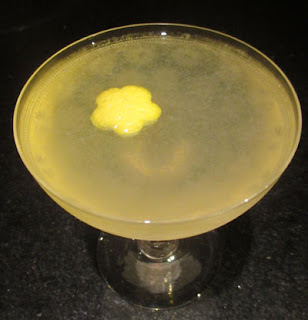 Next, a creamy lemon sip led into pisco and a medley of floral flavors on the swallow. Stir with ice and strain into a cocktail glass; I added an orange twist. Two Thursdays ago, I ventured into Pioneers of Mixing at Elite Bars: 1903-1933 and uncovered the Devonshire in the wine chapter. Given the Maraschino in the recipe, I figured that a nutty, oxidized sherry like an Amontillado would work perfectly here. 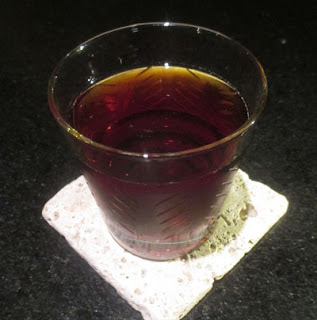 Moreover, the combination of Cointreau, Maraschino, and Picon was one that I have seen in old recipes such as the Mother-In-Law and White Rat and in newer ones like the Hoskins, so I was excited to give it a try here with sherry. Once built, the Devonshire shared an orange aroma over nutty grape and Maraschino notes. Next, the grape continued on into the sip along with a hint of orange, and this was chased by nutty sherry and cherry flavors on the swallow with a bitter orange finish. 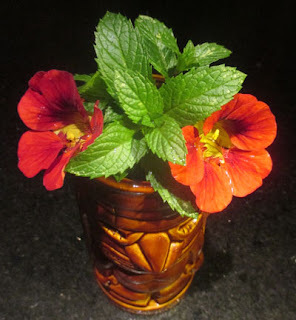 Shake with ice, strain into a Tiki mug, fill with crushed ice, and garnish with mint. After the previous night's enjoyment of the Gun Club Punch #2, I decided to riff on the combination by switching the sweeteners from curaçao and rock candy syrup to apricot liqueur and Swedish punsch that had worked rather well in the Havana Cocktail. 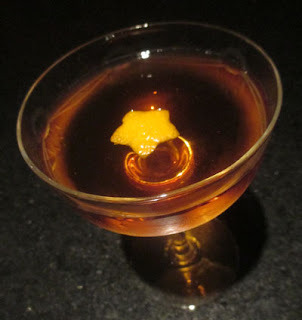 Moreover, I changed spirit base to a rhum agricole and tequila that impressed me in Martin Cate's Menehune Gonzalez. With the rum, grapefruit, and lime trio, I wanted to take a step closer to the Jet Pilot by adding back a small amount of spice through a dash of absinthe. In the mug, the garnishes greeted the nose with a mint and peppery floral bouquet. Next, grapefruit and lime on the sip transitioned into the combination of grassy and vegetal spirits and the apricot-Swedish punsch duo on the swallow with a light anise finish. Overall, the presence of apricot in the mix reminded me of the Golden Gun to some degree. Blend with a scoop of ice, pour into a Big Shot mug, and fill with ice cubes (shake with ice, strain into a Tiki mug, and fill with crushed ice). Garnish with fresh mint and a fruit stick (mint sprigs and grapefruit swath). Two Tuesdays ago, I was feeling in a tropical drink mood, so I selected Trader Vic's 1972 Bartender's Guide from the book shelf. There in the punch section was the second variation of the Gun Club Punch; I had made the first variation about two years ago. In the second variation, the juices went from lime and pineapple to lime and grapefruit and the sweeteners from grenadine and curaçao to rock candy syrup and curaçao; moreover, the partner of the light Puerto Rican rum switched from dark Jamaican to overproof Demerara. In both cases, I upped the sweeteners to better balance the lime juice's tartness. The Gun Club Punch #2 gave forth a mint and grapefruit aroma from the garnishes. 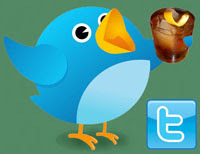 Next, lime and grapefruit mingled on the sip, and the swallow shared rum, orange, and vanilla notes. Overall, the rums, lime, and grapefruit reminded me of a Jet Pilot albeit in a more mellow format without all of the spice notes. Two Mondays ago, I reached for the Death & Co. Cocktail Book and ended up in the Daiquiri variation section. There, Phil Ward's 2008-vintage D.W.B. or Daiquiri with Benefits seemed like a good way to cap off the evening. 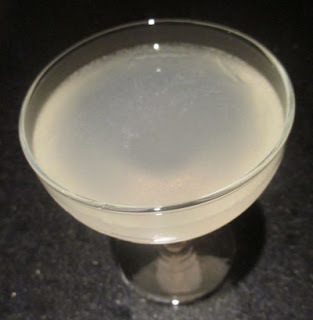 For a spirit base in an otherwise straightforward Daiquiri was the funky combination of rhum agricole and Batavia Arrack which I have only had paired together in the Sang et Sable. Once shaken and strained, the nose offered grassiness from the rhum agricole and a funk from both liquors that were brightened by the lime aroma. Next, the lime sang out on the sip, and the swallow was the intriguing transition of grassy flavors finishing with dry funk from the Batavia Arrack. Stir with ice, strain into a cocktail coupe with 2 oz sparkling wine (90+ Cellars Prosecco), and garnish with a lemon twist. Two Sundays ago, I thumbed through the new issue of Imbibe Magazine and spotted the section of Holiday cocktails. There, I was drawn to the Last Waltz by Justin Powell and Bobbi Kay at Berlin's Pauly Saal. Once prepared, the Last Waltz donated a lemon and rye aroma to the nose. Next, sparkling wine and a dark fruit note from the Cherry Heering filled the sip, and the swallow offered rye, chocolate, cherry, and spice flavors that made Andrea comment that it was "like a lightly carbonated Manhattan." Stir with ice, strain into a rocks glass, and garnish with orange oil from a twist. Two Saturdays ago, I was perusing the OnTheBar drink database when I spotted an interesting drink from Jenna Rycroft called the Puhi. Puhi is the Hawaiian word for eel, and it appeared part of her circa 2015 series at No. 9 Park that included the 'I'iwi Bird. Since the combination seemed like a good digestif and nightcap, I gave it a go. In the glass, the Puhi shared an orange aroma over nutty sherry and root beer notes. Next, the amari's caramel joined the sherry's grape on the sip, and the swallow displayed the great interplay of tequila and Cynar's vegetal flavors along with complementary coffee and chocolate notes from the other ingredients. On Friday two weeks ago, I delved into wine chapter of Pioneers of Mixing at Elite Bars: 1903-1933 and spotted the Stone. I followed the book's recommendation to substitute a rhum agricole for the call of early Bacardi Rum, and I figured that Rhum Clement would offer a bit of intrigue here. Once prepared, the Stone gave forth a grassy and mineral nose from the rhum agricole that joined notes of nutty grape from the sherry. Next, grape fill the sip, and it continued on into the swallow where it mingled with grassy rum flavors and was chased by a nutty and bitter orange finish. Shake with ice, strain into a 14 oz glass (Tiki mug), and fill with ice. Two Thursdays ago, I searched through Trader Vic's 1972 Bartender's Guuide and spotted the Sun and Shadow. The name reminded me of Joe Scialom's 1957 Sol y Sombra; however, the Scialom's recipe as provided by Jeff Berry's Potions of the Caribbean had different rums and an addition of bitters. Therefore, the Trader Vic drink seemed perhaps distinct enough to make as a variation. 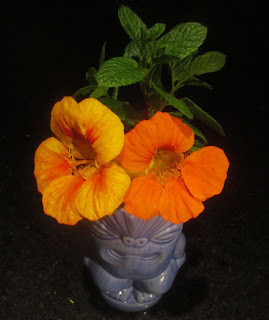 The Sun and Shadow presented a mint and peppery floral nose given my choice of mint sprigs and nasturtium blossom garnish. Next, lime, the dark rum's caramel, and a hint of pineapple on the sip transitioned into dark rum, overproof rum's heat, and apricot flavors modulated by pineapple on the swallow. Overall, it was not greatly different from the Sol y Sombra save for how the greater amount of dark rum and inclusion of overproof rum shifted the flavor balance away from the fruit notes to a darker and more boozy hot and dry drink. On my way from Harvard Square before meeting Andrea for dinner at Trina's Starlite Lounge, I popped into Kirkland Tap & Trotter for a round. For a drink, I requested the Sally Can't Surf that slightly reminded me of a Japanese in concept. In the glass, the Sally Can't Surf gave forth a lemon aroma with a fruity note from the Aperol. Next, a creamy orange-tinted sip shared the aged rum's caramel notes, and the swallow began with tequila and nutty flavors and ended with a bitter grapefruit finish and a richness from the rum and orgeat. Two Wendnesdays ago, I met friends at Les Sablons in Harvard Square. For a drink, I went with the namesake cocktail that has been attributed to bar director Jackson Cannon who also put the drink on the menu at sister restaurant Eastern Standard. As I have done with drinks such as the Parisian Orchid and Beacon Fix, I asked if I could have the Les Sablons with gin; in keeping with the French theme, I requested Citadelle Gin which I had spotted elsewhere on the menu. With gin, the drink recipe read like a Barbara West with Benedictine in the mix. The Les Sablons with gin greeted the senses with a lemon, savory, and juniper nose. 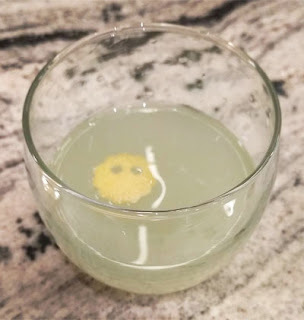 Next, the lemon and savory notes continued into the sip, and the swallow provided complementary gin and herbal flavors with a clean sherry finish.